Less than a year after Francois's death, I couldn't venture outside my apartments without encountering her and Henri's entwined initials everywhere, sprouting on tapestries and eaves like mushrooms after a raid. God forbid Diane ever desired something of mine, for hard-pressed would I be to defend it. In my readathon mini-challenge post, I mentioned that I have in the past been compelled to spend time searching for images online relating to Russia, Scotland and Tuscany for example, but I should have mentioned France as well. I spent ages at one point looking at Carcassonne, and another place that I have enjoyed looking at online is the Loire Valley, particularly some of the absolutely gorgeous chateaus that are scattered through. This is another reason why I like watching the Tour de France as well! One of the gorgeous chateaus that I would love to visit one day is connected with Catherine de Medici and the Diane mentioned in my teaser and that is Chenonceau! This image is from the official website for the chateau. This one's sitting on my shelf. I need to hurry up and read it! Everyone seems to like it. What a beautiful picture! It's hard to believe a place like that actually exists! Let me know when you're going - I'll go with you! Deal! It does look like a fairytale kind of place doesn't it! When I first saw a photo of that chateau, I was so fascinated that I sat and stared at it for ages, wondering what it would be like to live above flowing water like that. And here it is again. I want to go with you, as you seem to be collecting a tour group here! LOL. The Derrieux side of my family -- several generations back -- is from France, so it's possible one of my ancestors actually saw the place. The chateau is fabulous! Here is my teaser for this week. The book sounds good, might have to check it out, and the castle looks fabulous, not to mention the gardens!! Gorgeous! Nice, very nice...I am talking about the teaser and not the building although that's nice too. LMW, I didn't know that there was a Princess Bride connection! BookishSnob, I have done a tour but I would love to go again and see all the sights that I would appreciate much more this time around than I did when I was younger! Wouldn't it be fabulous fun Bonnie! I have always wanted to visit that castle -- it does have the fairy tale look about it. I have also been wanting to read The Confessions. I need to quit work. The entire valley is absolutely gorgeous however! What a gorgeous picture- that type of mini-challenge could be dangerous to my credit card! Lovely picture and interesting teaser! My teaser is from Troubled Waters by Sharon Shinn. Happy reading! Great teaser...I have this book on my tbr list...I can't wait to read it! I've been to that chateau, it's stunning, and I seem to remember a very long and beautiful gallery, though I was very young so everything would've looked bigger. I've had Gortner's book on Juana on my list for a year or so now, but I didn't know about this one. Love the teaser and LOVE the picture. That place is amazing! Thanks for sharing. My teaser is at The Crowded Leaf. Talk about a pushy woman! Great teaser. These historical novels have such beautiful language...ah, the bliss of reading such prose! Sounds an intriguing read. Chenonceau is one of the most gorgeous chateaux of the Loire Valley, both inside and out, but my favorite will always be Chambord. Wonderful teaser!! 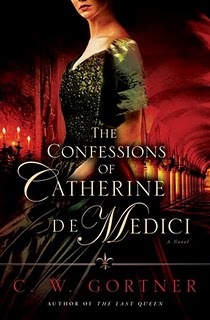 Catherine de Medici must have been a fascinating woman! Great teaser! I hope I get my hands on this one soon! I'm really curious now... going to look up this book. Love the picture. I remember seeing a beautiful picture of Carconne in my introduction to sociology textbook! A long time ago I spent Quatorze Juillet at Carcassonne. The night-time fireworks over the beautifully lit fortress is a sight I hope I will never forget. And Chenonceau has been high on my destination wishlist ever since I received a postcard from there as a child. Thank you the memories your post inspired! I look forward to reading your review of Gortner's latest. Great teaser! I hope that you're enjoying your book! nice. I've heard good things about this book. On another subject, any chance of an 'after cooling off period' post about your ereader?